Cortisone addiction is no allegory. The movie of Bigger Than Life was based on a 1955 New Yorker article titled “Ten Feet Tall” written by Berton Roueché who also wrote the 1980 book Medical Detectives which became one of the inspirations for the House TV series. What was the biggest news from the laboratories and workshops of the scientists this year? If you were to ask 10 of America’s best-known science reporters—as Popular Science has done—you would get 10 different answers to this question. The 10 journalists to whom the question was put are pictured below. All of them are members of the National Association of Science Writers. They cover science news the way Washington correspondents cover politics and police reporters cover crime. They have spent the past year interviewing scientists, attending scientific meetings and studying scientific reports to obtain the news of science for the readers of the newspapers, press associations and magazines that they represent. The stories that they consider this year’s biggest news are summarized in the article that follows. More was learned this year about new drugs, dreaded diseases and nature’s methods—as well as atomic warfare. • Ways were found to make wonderful new drugs plentiful. • New concepts and techniques led to more advances in the science of prolonging human life. • Men began to control the weather, and found a key to the method by which plants turn sunshine into food. 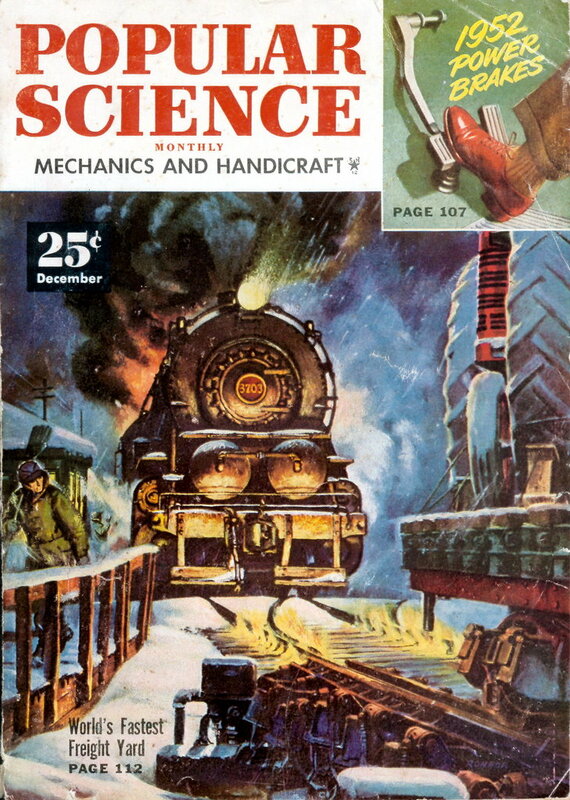 Arthur J. Snider, science editor of The Chicago Daily News, believes that “the disclosure that the Armed Forces can be successfully atom-powered is the year’s biggest science news. “With small atomic artillery capable of firing into concentrations of troops, the ways of tactical warfare are to be revolutionized,” he explains. “No longer will splitting the enemy into small segments be the aim of ground warfare. Attacking armies will now try to force large numbers of the enemy to mass. This means, he believes, that we must be producing fissionable material faster than the public has supposed, that new sources of fissionable material must be available, and that atomic energy for industrial use may o/# be nearer than we realize. William L. Laurence, of The New York Times, was the first science writer to see an atom bomb go off, but he differs with those who consider atomic developments the biggest science news of 1951. He considers the synthesis of the basic steroid from which cortisone can now be made the big story this year. Cortisone (PS, June ’51, p. 97) is one of the hormones which have produced remarkable results in treating arthritis and other diseases. This year a team of chemists at Harvard, led by Prof. Robert B. Woodward, developed a way of making a basic steroid from a simple coal-tar derivative. At almost the same time, another Harvard research team found a way to close a missing link in the chain of processes between the steroid and cortisone. Paul F. Ellis, science editor of the United Press, considers another story about cortisone the year’s biggest science news. This was the synthesis of cortisone from a wild Mexican yam by a group of Mexican scientists led by Dr. George Rosenkranz. Dr. Brown describes L-organisms as half virus and half bacteria. They live inside the cells of the body. There they multiply and move out into the spaces between the cells as antigens. These antigens provoke the defense forces of the human body, the anti- bodies, into action. The war between the two, according to the theory, creates a state of hypersensitivity, especially in the joints. This is the cause of the agonizing pains, swelling and crippling effects of arthritis. Cortisone, Dr. Brown believes, acts as a “blocking agent,” keeping the antigens and the antibodies apart so that the reaction between them does not take place. Alton L. Blakeslee, science reporter for the Associated Press, calls attention to the discovery of substances in mother’s milk that destroy viruses of many diseases. A pair of chemicals turned up by Dr. Albert Sabin of the University of Cincinnati act as antibodies against the viruses of encephalitis, yellow fever, dengue fever and cold sores. Dr. Sabin had previously found in milk an antibody against polio. The chemicals are found only at intervals, and only in certain mothers. Whether the antibodies protect babies against disease, is still to be discovered. When the parents of 10-month-old Michael Zielinski, dying of meningitis in a Schenectady hospital, read this story in The American Weekly, they insisted that Michael be given bacitracin. The baby was completely cured. William S. Barton, science editor of the Los Angeles Times, found the year’s big news in another aspect of medical research. He nominates an improvement in a test for cancer that enables it to be done with common materials. “I know of no story more important than one that indicates that it soon will be possible to diagnose cancer at such an early stage that cures are almost certain to be effected,” Barton explains. The test is the result of many years of research by Dr. Harry S. Penn, a practicing physician. The test originally required an extract made from the livers of persons who had just died of cancer. Now Dr. Penn has found that it can be prepared synthetically from a common organic substance. This may bring the cost down to 25 cents a test, cheap enough for it to be used to screen whole communities at a time. Leading figure in the commercial rain-making was Dr. Irving P. Krick, of Denver. His contracts for the summer of 1951 covered 436,800 square miles. Watson Davis, director of Science Service, also feels that his choice may outweigh the atom bomb in long-term importance. It deals with the mysterious way in which plants are able to use their green leaves to transform sunlight into food. A new theory to explain this was announced this year by Dr. Dean Bulk, of the U. S. National Institutes of Health, and Otto Warburg, Nobel prize winner. Crux of the problem is that it takes at least three units of energy to manufacture one molecule of carbohydrate, the food the plant makes from sunlight. Yet sunlight supplies only one unit of energy at a time. Now the researchers have found that each unit as received activates an unknown substance in the plant to start a chemical reaction. Three reactions produce a carbohydrate molecule. Dr Merchant’s “L-organisms”, “half virus and half bacteria”, have not survived as a cause of arthritis. 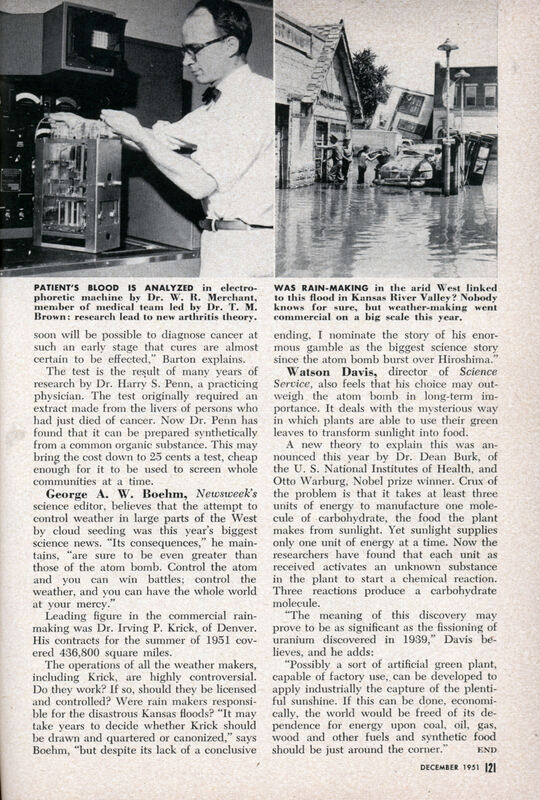 Weather control is pretty much mythical, and the attempts to provide mobile atomic power sources for the Army were more trouble than they were worth. On the other hand, antibiotic did revolutionise the treatment of meningitis, along with many other things, but you did have to get in there quickly before it started to damage the brain. As for artificial chlorophyll to harvest energy from sunlight as efficiently and easily as a plant, this is still an aim and still a long way off. On the other hand, artificial steroids have saved millions of lives – including my own. I’d say cortisone beats atomic artillery by a long shot. @ Charlene – Have you ever seen the James Mason movie “Bigger than Life”? The story about bacitracin is particularly important to me because when I was a baby dying of meningitis it saved my life as well. Addicted to CORTISONE? I guess it was meant as an allegory, but couldn’t they have invented a more realistic addiction, like – I don’t know – grape Nehi or aspirin? @ Charlene – I heard the movie was based on a real life case.